In 1989, Peggy Tabor Millin joined a group of non-Catholics as chronicler on a pilgrimage to Medjugorje, Bosnia, where Mary, mother of Jesus, had been appearing to a group of young people since 1981. Although she did not expect to be affected by her journey, what occurred changed her life, leading her along a path she calls "Mary's way." Twenty years later, she understood that Mary had been appearing in order to prepare us for what is happening now. 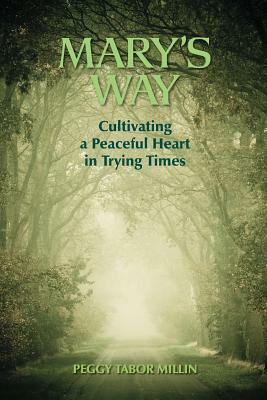 Millin then knew she was to republish the book with a new subtitle to reflect the intent of the messages: Cultivating a Peaceful Heart in Trying Times. This is a book about spiritual connections, about the use of Mary's way in opening a deep communion with divine love, and about the possibility of transformation in our daily lives. Mary's message is universal-individuals from all religious and spiritual paths will find guidance and inspiration. Millin writes, "The spiritual journey has no goal, nothing tangible to grasp, not even a permanent state of being. Enlightenment comes in flashes of in-sight that last as long as they last. Such flashes arise from shifting our focus from the material world to the inner life of the soul. Our outer life then becomes a reflection of our inner reality: increasingly the heart rests in peace and selfless service replaces striving. This shift in focus rearranges our priorities; we give up what no longer serves this higher purpose and are occasionally surprised by glimpses of the resplendent 'pearl of great price.'" Peggy Tabor Millin is author of the award-winning book, Women, Writing, and Soul-Making: Creativity and the Sacred Feminine. She offers classes and retreat for women in the writing process. Her mission is to provide a safe space for women to develop and claim their voice so they can stand in their power and inspire positive change in their world. Learn more about her work at clarityworksonline.com.